W.S. Rawlings, detail from Board of Park Commissioners, 1919, Vancouver City Archives, Port P468, http://searcharchives.vancouver.ca/board-of-park-commissioners-13. William Stanley Rawlings was the superintendent of Vancouver’s parks from 1913 to 1936. He lived at 1155 Park Road (called Lagoon Drive after 1929) from 1915 to 1937. William Stanley Rawlings was born in London, England, on December 6, 1882. His father was William Henry Rawlings, who was an architect and carpenter. His mother was Ellen Jane Maggs. From 1905 to 1910 he was the county surveyor of Wiltshire, England. 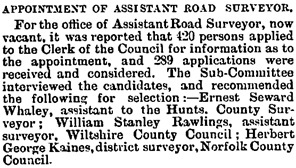 In 1907 he applied for a position as the assistant road surveyor in Cambridgeshire. “Cambs. County Council,” Cambridge Independent Press (Cambridge, England), January 18, 1907; issue 4727, page 5. While he was in England, he was a pupil and assistant to Allen Shakespeare Wootton (1873-1950), who was the town engineer of Bradford-on-Avon. William first appeared in the Vancouver directories in 1911. He was the secretary to the Vancouver Parks Board. On February 24, 1914, in Kamloops, British Columbia, William married Dora Winifred Soul. She was born in Totnes, Devonshire, England, in 1883. Her father was Richard Soul (1842-1922). Her mother was Harriet Clarabut (1844-1917). William was an enthusiastic support of parks, playgrounds and other recreational facilities. He studied reforestation and the care of trees, focusing especially on Stanley Park. He also promoted the idea of building a marine walkway on the Stanley Park seawall. He served as the park superintendent until 1936, when he resigned because of ill health. He died in Vancouver on August 10, 1937. He was buried in Mountain View Cemetery in Vancouver. Rawlings Trail in Stanley Park is named for him. Little further information is available for Dora. It appears that she died about 1967, and that she was buried in Mountain View Cemetery in Vancouver. William and Dora had the following children. John Richard Rawlings was born prematurely in Vancouver on October 26, 1918. He lived only eight hours, and he died on October 26. He was buried in Mountain View Cemetery in Vancouver. Richard William Rawlings was born prematurely in Vancouver on January 17, 1923. He died on January 18, 1923. He was buried in Mountain View Cemetery in Vancouver. It appears that Joyce Rawlings was born after 1923. She was living with her parents when her father died in 1937. No further information is available for her. “England and Wales Marriage Registration Index, 1837-2005,” database, FamilySearch (https://familysearch.org/ark:/61903/1:1:2D5N-LNV : 13 December 2014), William Henry Rawlings, 1878; from “England & Wales Marriages, 1837-2005,” database, findmypast (http://www.findmypast.com : 2012); citing 1878, quarter 4, vol. 1A, p. 539, Chelsea, London, England, General Register Office, Southport, England. “England and Wales Census, 1881,” database with images, FamilySearch (https://familysearch.org/ark:/61903/1:1:Q273-BJFV : 18 August 2016), William Rawlings, St Pancras, London,Middlesex, England; from “1881 England, Scotland and Wales census,” database and images, findmypast (http://www.findmypast.com : n.d.); citing p. 68, Piece/Folio 216/106, The National Archives, Kew, Surrey; FHL microfilm 101,774,360. “England and Wales Death Registration Index 1837-2007,” database, FamilySearch (https://familysearch.org/ark:/61903/1:1:2JFG-YV3 : 31 December 2014), William Henry Rawlings, 1890; from “England & Wales Deaths, 1837-2006,” database, findmypast (http://www.findmypast.com : 2012); citing Death, St. George Hanover Square, London, England, General Register Office, Southport, England. “England and Wales Birth Registration Index, 1837-2008,” database, FamilySearch (https://familysearch.org/ark:/61903/1:1:265H-HVD : 1 October 2014), Ellen Jane Maggs, 1856; from “England & Wales Births, 1837-2006,” database, findmypast (http://www.findmypast.com : 2012); citing Birth Registration, Kensington, London, England, citing General Register Office, Southport, England. (possible connection). “England and Wales Census, 1861,” database with images, FamilySearch (https://familysearch.org/ark:/61903/1:1:Q2MP-SVWD : 6 April 2016), Ellen Maggs in household of John Smith, Mitcham, Surrey, England; from “1861 England, Scotland and Wales census,” database and images, findmypast (http://www.findmypast.com : n.d.); citing PRO RG 9, The National Archives, Kew, Surrey. (possible connection). “England and Wales Census, 1871”, database with images, FamilySearch (https://familysearch.org/ark:/61903/1:1:VFVM-CHF : 22 July 2015), Ellen J Maggs in entry for Mary H Maggs, 1871. (possible connection). “England and Wales Marriage Registration Index, 1837-2005,” database, FamilySearch (https://familysearch.org/ark:/61903/1:1:2D5N-9BX : 13 December 2014), Ellen Jane Maggs, 1878; from “England & Wales Marriages, 1837-2005,” database, findmypast (http://www.findmypast.com : 2012); citing 1878, quarter 4, vol. 1A, p. 539, Chelsea, London, England, General Register Office, Southport, England. “England and Wales Census, 1881,” database with images, FamilySearch (https://familysearch.org/ark:/61903/1:1:Q273-BJN6 : 18 August 2016), Ellen Rawlings in household of William Rawlings, St Pancras, London,Middlesex, England; from “1881 England, Scotland and Wales census,” database and images, findmypast (http://www.findmypast.com : n.d.); citing p. 68, Piece/Folio 216/106, The National Archives, Kew, Surrey; FHL microfilm 101,774,360. “England and Wales Census, 1901,” database, FamilySearch (https://familysearch.org/ark:/61903/1:1:XSV1-ZQJ : 29 August 2015), Ellen J Rawlings, Bradford On Avon, Wiltshire, England; from “1901 England, Scotland and Wales census,” database and images, findmypast (http://www.findmypast.com : n.d.); citing Bradford South Eastern subdistrict, PRO RG 13, The National Archives, Kew, Surrey. The First Hundred Years: An Illustrated Celebration; by R. Mike Steele; Vancouver; Vancouver Board of Parks and Recreation, 1988, pages 23, 53,76, 81, 210, 213, 217, 219, and 230. “England and Wales Birth Registration Index, 1837-2008,” database, FamilySearch (https://familysearch.org/ark:/61903/1:1:2X2M-QP2 : 1 October 2014), William Stanley Rawlings, 1883; from “England & Wales Births, 1837-2006,” database, findmypast (http://www.findmypast.com : 2012); citing Birth Registration, St. George Hanover Square, London, England, citing General Register Office, Southport, England. “England and Wales Census, 1891,” database with images, FamilySearch (https://familysearch.org/ark:/61903/1:1:4JBR-FT2 : 15 October 2015), William S Rawlings in household of Frank Rawlings, Trowbridge, Wiltshire, England; from “1891 England, Scotland and Wales census,” database and images, findmypast (http://www.findmypast.com : n.d.); citing PRO RG 12, Wiltshire county, subdistrict, The National Archives of the UK, Kew, Surrey. “England and Wales Census, 1901,” database, FamilySearch (https://familysearch.org/ark:/61903/1:1:XSV1-ZQK : 29 August 2015), William S Rawlings in household of Ellen J Rawlings, Bradford On Avon, Wiltshire, England; from “1901 England, Scotland and Wales census,” database and images, findmypast (http://www.findmypast.com : n.d.); citing Bradford South Eastern subdistrict, PRO RG 13, The National Archives, Kew, Surrey. “New York Passenger Arrival Lists (Ellis Island), 1892-1924,” database, FamilySearch (https://familysearch.org/ark:/61903/1:1:JN18-9Z5 : 6 December 2014), William Stanley Rawlings, 30 Apr 1913; citing departure port Queenstown, arrival port New York, ship name Olympic, NARA microfilm publication T715 and M237 (Washington D.C.: National Archives and Records Administration, n.d.). “British Columbia Marriage Registrations, 1859-1932; 1937-1938,” database with images, FamilySearch (https://familysearch.org/ark:/61903/1:1:JD8V-L2G : 21 January 2016), William Stanley Rawlings and Dora Winifred Soul, 24 Feb 1914; citing Kamloops, British Columbia, Canada, British Columbia Archives film number B11384, Vital Statistics Agency, Victoria; FHL microfilm 1,983,977. 1921 Canada Census, W. Stanley Rawlings, Reference Number: RG 31; Folder Number: 18; Census Place: Ward 1, Vancouver Centre, British Columbia; Page Number: 5; Ancestry.com. 1921 Census of Canada [database on-line]. Provo, UT, USA: Ancestry.com Operations Inc, 2013. “British Columbia Death Registrations, 1872-1986; 1992-1993”, database with images, FamilySearch (https://familysearch.org/ark:/61903/1:1:FL2J-DY9 : 30 September 2015), William Stanley Rawlings, 1937. “Find A Grave Index,” database, FamilySearch (https://familysearch.org/ark:/61903/1:1:QVV5-7FNY : 13 December 2015), William Stanley Rawlings, 1937; Burial, Vancouver, Greater Vancouver Regional District, British Columbia, Canada, Mountain View Cemetery; citing record ID 26285586, Find a Grave, http://www.findagrave.com/cgi-bin/fg.cgi?page=gr&GRid=26285586. Stanley Park National Historic Site of Canada, Canada’s Historic Places, http://www.historicplaces.ca/en/rep-reg/place-lieu.aspx?id=12546. Vancouver, British Columbia: Its Parks and Resorts, 1919, by W. S. Rawlings. “John Soul was not originally from Amesbury – he was born in Shaftesbury in 1866, the eldest of seven children. His grandfather Richard Soul and three sons were all born in Olney Buckinghamshire. The sons were: John James (the Amesbury John’s father), Edward, and the youngest – also called Richard. Richard the elder had a grocery business in Olney before moving to Shaftesbury where he was a grocer and tea dealer. In 1871 he was in Fisherton Anger and, by 1875, he and all his sons were established in Amesbury. “England and Wales Birth Registration Index, 1837-2008,” database, FamilySearch (https://familysearch.org/ark:/61903/1:1:2NQ2-XW2 : 1 October 2014), Richard Soul, 1842; from “England & Wales Births, 1837-2006,” database, findmypast (http://www.findmypast.com : 2012); citing Birth Registration, Newport Pagnell, Buckinghamshire, England, citing General Register Office, Southport, England. “England and Wales Marriage Registration Index, 1837-2005,” database, FamilySearch (https://familysearch.org/ark:/61903/1:1:2DL7-P57 : 13 December 2014), Richard Saul, 1871; from “England & Wales Marriages, 1837-2005,” database, findmypast (http://www.findmypast.com : 2012); citing 1871, quarter 1, vol. 3A, p. 592, Newport Pagnell, Buckinghamshire, England, General Register Office, Southport, England. “England and Wales Census, 1871”, database with images, FamilySearch (https://familysearch.org/ark:/61903/1:1:VFJS-V3Y : 24 July 2015), Richard Soul, 1871. “England and Wales Census, 1881,” database with images, FamilySearch (https://familysearch.org/ark:/61903/1:1:Q278-PJVY : 18 August 2016), Richard Junr Soul, Amesbury, Wiltshire, England; from “1881 England, Scotland and Wales census,” database and images, findmypast (http://www.findmypast.com : n.d.); citing p. 11, Piece/Folio 2064/52, The National Archives, Kew, Surrey; FHL microfilm 101,774,648. “England and Wales Census, 1891,” database with images, FamilySearch (https://familysearch.org/ark:/61903/1:1:WCGT-1MM : 15 October 2015), Richard Soul, Totnes, Devon, England; from “1891 England, Scotland and Wales census,” database and images, findmypast (http://www.findmypast.com : n.d.); citing PRO RG 12, Devon county, subdistrict, The National Archives of the UK, Kew, Surrey. “England and Wales Census, 1901,” database, FamilySearch (https://familysearch.org/ark:/61903/1:1:X9W1-KV1 : 29 August 2015), Richard Soul, Wellington, Somersetshire, England; from “1901 England, Scotland and Wales census,” database and images, findmypast (http://www.findmypast.com : n.d.); citing Wellington subdistrict, PRO RG 13, The National Archives, Kew, Surrey. “England and Wales Census, 1911,” database, FamilySearch (https://familysearch.org/ark:/61903/1:1:XW9L-6LS : 20 January 2015), Richard Soul, Cullompton, Higher Bull Ring Cullompton, Devonshire, England; from “1911 England and Wales census,” database and images, findmypast (http://www.findmypast.com : n.d.); citing PRO RG 14, The National Archives of the UK, Kew, Surrey. “England and Wales Death Registration Index 1837-2007,” database, FamilySearch (https://familysearch.org/ark:/61903/1:1:QVHQ-NJZC : 4 September 2014), Richard Soul, 1922; from “England & Wales Deaths, 1837-2006,” database, findmypast (http://www.findmypast.com : 2012); citing Death, Totnes, Devon, England, General Register Office, Southport, England. “England and Wales Birth Registration Index, 1837-2008,” database, FamilySearch (https://familysearch.org/ark:/61903/1:1:26B4-M3Y : 1 October 2014), Harriet Clarabut, 1844; from “England & Wales Births, 1837-2006,” database, findmypast (http://www.findmypast.com : 2012); citing Birth Registration, Newport Pagnell, Buckinghamshire, England, citing General Register Office, Southport, England. “England and Wales Census, 1851,” database with images, FamilySearch (https://familysearch.org/ark:/61903/1:1:SGVP-YHX : 24 July 2016), Harriet Clarabut in household of Daniel Clarabut, Olney, Buckinghamshire, England; citing Olney, Buckinghamshire, England, p. 1, from “1851 England, Scotland and Wales census,” database and images, findmypast (http://www.findmypast.com : n.d.); citing PRO HO 107, The National Archives of the UK, Kew, Surrey. “England and Wales Census, 1861,” database with images, FamilySearch (https://familysearch.org/ark:/61903/1:1:M7KS-761 : 6 April 2016), Harriett Clarabut in household of Daniel Clarabut, Olney, Buckinghamshire, England; from “1861 England, Scotland and Wales census,” database and images, findmypast (http://www.findmypast.com : n.d.); citing PRO RG 9, The National Archives, Kew, Surrey. “England and Wales Marriage Registration Index, 1837-2005,” database, FamilySearch (https://familysearch.org/ark:/61903/1:1:2DLQ-Q7W : 13 December 2014), Harriet Clarabut, 1871; from “England & Wales Marriages, 1837-2005,” database, findmypast (http://www.findmypast.com : 2012); citing 1871, quarter 1, vol. 3A, p. 592, Newport Pagnell, Buckinghamshire, England, General Register Office, Southport, England. “England and Wales Census, 1871”, database with images, FamilySearch (https://familysearch.org/ark:/61903/1:1:VFJS-V3B : 24 July 2015), Harriet Soul in entry for Richard Soul, 1871. “England and Wales Census, 1881,” database with images, FamilySearch (https://familysearch.org/ark:/61903/1:1:Q278-PJKJ : 18 August 2016), Harriet Soul in household of Richard Junr Soul, Amesbury, Wiltshire, England; from “1881 England, Scotland and Wales census,” database and images, findmypast (http://www.findmypast.com : n.d.); citing p. 11, Piece/Folio 2064/52, The National Archives, Kew, Surrey; FHL microfilm 101,774,648. “England and Wales Census, 1891,” database with images, FamilySearch (https://familysearch.org/ark:/61903/1:1:WCGY-7MM : 15 October 2015), Harriett Soul in household of Richard Soul, Totnes, Devon, England; from “1891 England, Scotland and Wales census,” database and images, findmypast (http://www.findmypast.com : n.d.); citing PRO RG 12, Devon county, subdistrict, The National Archives of the UK, Kew, Surrey. “England and Wales Census, 1901,” database, FamilySearch (https://familysearch.org/ark:/61903/1:1:X9W1-KKM : 29 August 2015), Harriet Soul in household of Richard Soul, Wellington, Somersetshire, England; from “1901 England, Scotland and Wales census,” database and images, findmypast (http://www.findmypast.com : n.d.); citing Wellington subdistrict, PRO RG 13, The National Archives, Kew, Surrey. “England and Wales Census, 1911,” database, FamilySearch (https://familysearch.org/ark:/61903/1:1:XW9L-6L3 : 20 January 2015), Harriet Soul, Cullompton, Higher Bull Ring Cullompton, Devonshire, England; from “1911 England and Wales census,” database and images, findmypast (http://www.findmypast.com : n.d.); citing PRO RG 14, The National Archives of the UK, Kew, Surrey. “England and Wales Death Registration Index 1837-2007,” database, FamilySearch (https://familysearch.org/ark:/61903/1:1:2JC7-Q21 : 31 December 2014), Harriett Soul, 1917; from “England & Wales Deaths, 1837-2006,” database, findmypast (http://www.findmypast.com : 2012); citing Death, Tiverton, Devon, England, General Register Office, Southport, England. “Find A Grave Index,” database, FamilySearch (https://familysearch.org/ark:/61903/1:1:QVGJ-69M4 : 13 December 2015), Harriett Soul, ; Burial, Cullompton, Mid Devon District, Devon, England, Cullompton Cemetery; citing record ID 124161818, Find a Grave, http://www.findagrave.com/cgi-bin/fg.cgi?page=gr&GRid=124161818. “England and Wales Birth Registration Index, 1837-2008,” database, FamilySearch (https://familysearch.org/ark:/61903/1:1:2X2C-N7T : 1 October 2014), Dora Winifred Soul, 1883; from “England & Wales Births, 1837-2006,” database, findmypast (http://www.findmypast.com : 2012); citing Birth Registration, Totnes, Devon, England, citing General Register Office, Southport, England. “England and Wales Census, 1891,” database with images, FamilySearch (https://familysearch.org/ark:/61903/1:1:WCGY-GPZ : 15 October 2015), Dora Winifred Soul in household of Richard Soul, Totnes, Devon, England; from “1891 England, Scotland and Wales census,” database and images, findmypast (http://www.findmypast.com : n.d.); citing PRO RG 12, Devon county, subdistrict, The National Archives of the UK, Kew, Surrey. “England and Wales Census, 1901,” database, FamilySearch (https://familysearch.org/ark:/61903/1:1:XS8P-BDD : 28 August 2015), Dora W Soul in household of Elizabeth Hitchcock, Wiveliscombe, Somersetshire, England; from “1901 England, Scotland and Wales census,” database and images, findmypast (http://www.findmypast.com : n.d.); citing Wiveliscombe subdistrict, PRO RG 13, The National Archives, Kew, Surrey. “England and Wales Census, 1911,” database, FamilySearch (https://familysearch.org/ark:/61903/1:1:X7RH-PHB : 20 January 2015), Dora Winifred Soul, Taunton St Mary Magdalen Within, , Somersetshire, England; from “1911 England and Wales census,” database and images, findmypast (http://www.findmypast.com : n.d.); citing PRO RG 14, The National Archives of the UK, Kew, Surrey. “British Columbia Marriage Registrations, 1859-1932; 1937-1938,” database with images, FamilySearch (https://familysearch.org/ark:/61903/1:1:JD8V-L2K : 21 January 2016), William Stanley Rawlings and Dora Winifred Soul, 24 Feb 1914; citing Kamloops, British Columbia, Canada, British Columbia Archives film number B11384, Vital Statistics Agency, Victoria; FHL microfilm 1,983,977. 1921 Canada Census, Winifred Rawlings in household of W. Stanley Rawlings, Reference Number: RG 31; Folder Number: 18; Census Place: Ward 1, Vancouver Centre, British Columbia; Page Number: 5; Ancestry.com. 1921 Census of Canada [database on-line]. Provo, UT, USA: Ancestry.com Operations Inc, 2013. “Washington, Seattle, Passenger Lists, 1890-1957,” database with images, FamilySearch (https://familysearch.org/ark:/61903/1:1:KY2M-QKB : 4 December 2014), Dora W Rawlings, ; citing Seattle, King, Washington, United States, NARA microfilm publication M1383, National Archives and Records Administration, Washington, D.C.; FHL microfilm 1,454,981. “Find A Grave Index,” database, FamilySearch (https://familysearch.org/ark:/61903/1:1:QVV5-7FFG : 13 December 2015), Dora Winnifred Rawlings, ; Burial, Vancouver, Greater Vancouver Regional District, British Columbia, Canada, Mountain View Cemetery; citing record ID 26356585, Find a Grave, http://www.findagrave.com/cgi-bin/fg.cgi?page=gr&GRid=26356585. “British Columbia Death Registrations, 1872-1986; 1992-1993”, database with images, FamilySearch (https://familysearch.org/ark:/61903/1:1:QK6G-4K42 : 5 October 2015), John Richard Rawlings, 1918. “British Columbia Death Registrations, 1872-1986; 1992-1993”, database with images, FamilySearch (https://familysearch.org/ark:/61903/1:1:QK6G-H2JZ : 5 October 2015), Richard William Rawlings, 1923. “England Births and Christenings, 1538-1975,” database, FamilySearch (https://familysearch.org/ark:/61903/1:1:NV6T-SXG : 30 December 2014), Allen Shakespeare Wootton, 14 Sep 1873; citing Brackley, Northampton, England, reference yrs 1857-1884 p 116; FHL microfilm 6,126,775. “England and Wales Birth Registration Index, 1837-2008,” database, FamilySearch (https://familysearch.org/ark:/61903/1:1:2XCX-SNY : 1 October 2014), Allen Shakespeare Wootton, 1873; from “England & Wales Births, 1837-2006,” database, findmypast (http://www.findmypast.com : 2012); citing Birth Registration, Brackley, Northamptonshire, England, citing General Register Office, Southport, England. “England and Wales Census, 1881,” database with images, FamilySearch (https://familysearch.org/ark:/61903/1:1:Q27C-M2XN : 18 August 2016), Allen Shakespeare Wootton in household of James Allen Wootton, Brackley St Peter, Northamptonshire, England; from “1881 England, Scotland and Wales census,” database and images, findmypast (http://www.findmypast.com : n.d.); citing p. 15, Piece/Folio 1531/49, The National Archives, Kew, Surrey; FHL microfilm 101,774,472. “England and Wales Census, 1891,” database with images, FamilySearch (https://familysearch.org/ark:/61903/1:1:4YYG-TZM : 14 October 2015), Allen S Wootton, Normanton, Rutland, England; from “1891 England, Scotland and Wales census,” database and images, findmypast (http://www.findmypast.com : n.d.); citing PRO RG 12, Rutland county, subdistrict, The National Archives of the UK, Kew, Surrey. “England and Wales Marriage Registration Index, 1837-2005,” database, FamilySearch (https://familysearch.org/ark:/61903/1:1:26S7-8NG : 13 December 2014), Allen Shakespeare Wootton, 1900; from “England & Wales Marriages, 1837-2005,” database, findmypast (http://www.findmypast.com : 2012); citing 1900, quarter 4, vol. 2B, p. 369, Lewes, Sussex, England, General Register Office, Southport, England. “England and Wales Census, 1901,” database, FamilySearch (https://familysearch.org/ark:/61903/1:1:XSWF-VFT : 29 August 2015), Allen Shakespeare Wootton, South Molton, Devonshire, England; from “1901 England, Scotland and Wales census,” database and images, findmypast (http://www.findmypast.com : n.d.); citing Chulmleigh subdistrict, PRO RG 13, The National Archives, Kew, Surrey. “Recensement du Canada de 1911,” database, FamilySearch (https://familysearch.org/ark:/61903/1:1:QV9P-BYZN : 2 March 2015), Allen S Wootton, 1911; citing Census, New Westminster Sub-Districts 1-20, British Columbia, Canada, Library and Archives of Canada, Ottawa, Ontario; FHL microfilm 2,417,660. “British Columbia Death Registrations, 1872-1986; 1992-1993”, database with images, FamilySearch (https://familysearch.org/ark:/61903/1:1:FLPS-WNL : 30 September 2015), Allen Shakespeare Wootton, 1950. “British Columbia Death Registrations, 1872-1986; 1992-1993”, database with images, FamilySearch (https://familysearch.org/ark:/61903/1:1:FL5N-N6S : 30 September 2015), Marion Selby Wootton, 1955.